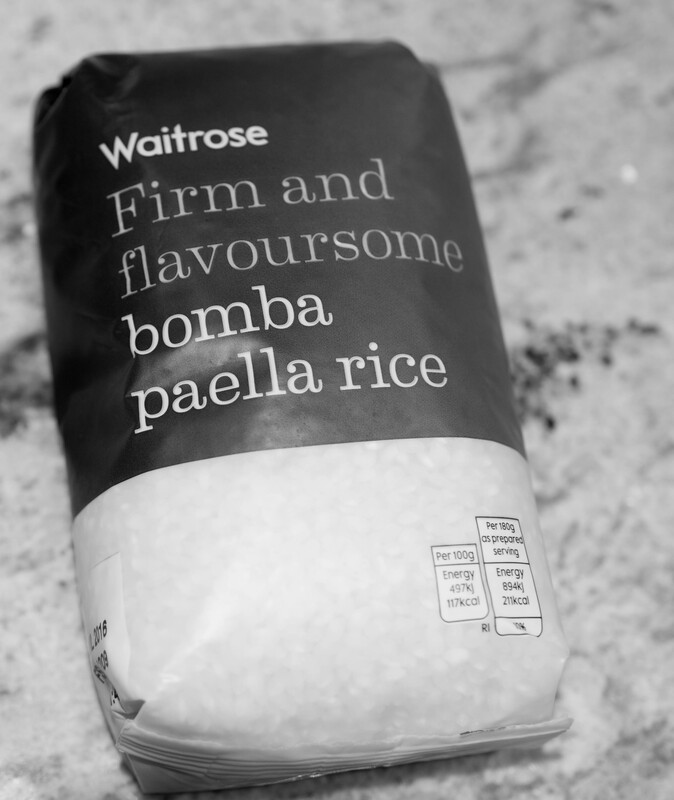 It is simpler than you might think to cook a great Paella. 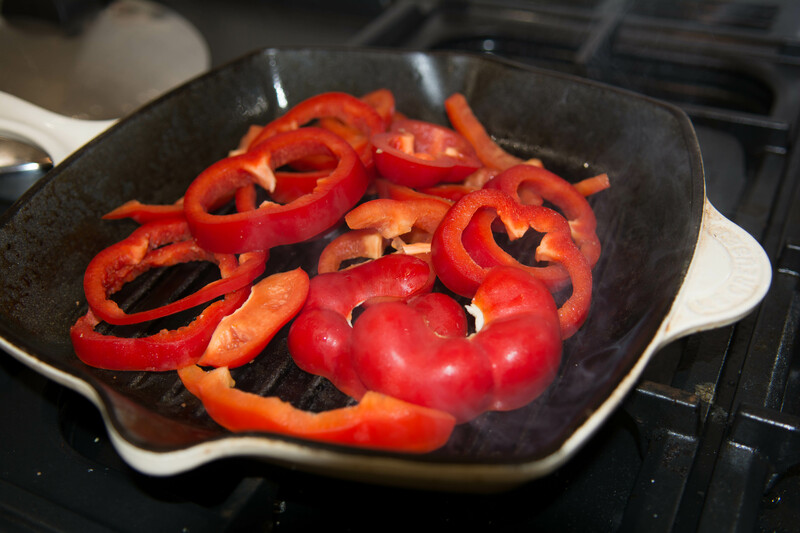 This dish involves using two pans with a spot of simple alternation between them in the last 10 minutes of cooking. Do not be put off by multi tasking. 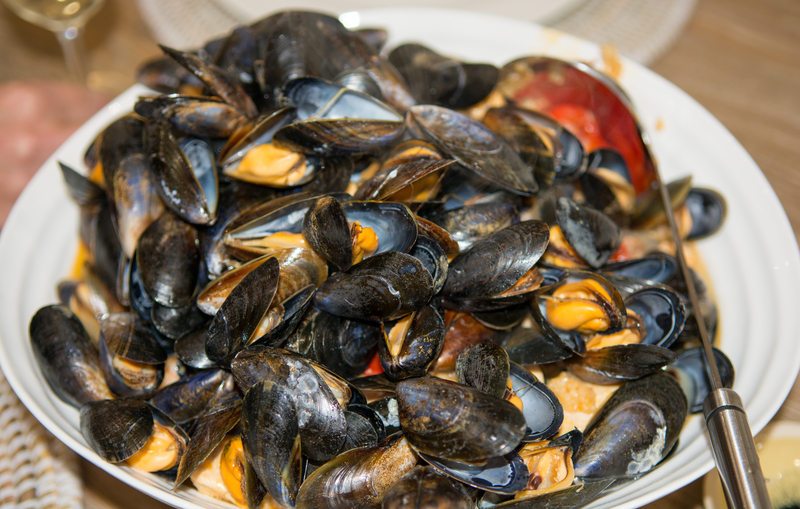 First soak the mussels in a sink or bowl of cold water, and check each one. Remove (by simply tearing off towards the thin point of the mussel) any ‘beards’. Discard any with broken or open shells at this point. And scrape off with a sharp knife, any barnacles. I pop the good ones in a colander, which I place in the sink. Next put a glug of olive oil in a large, solid pan (Le Creuset is good, a pressure cooker is good too). 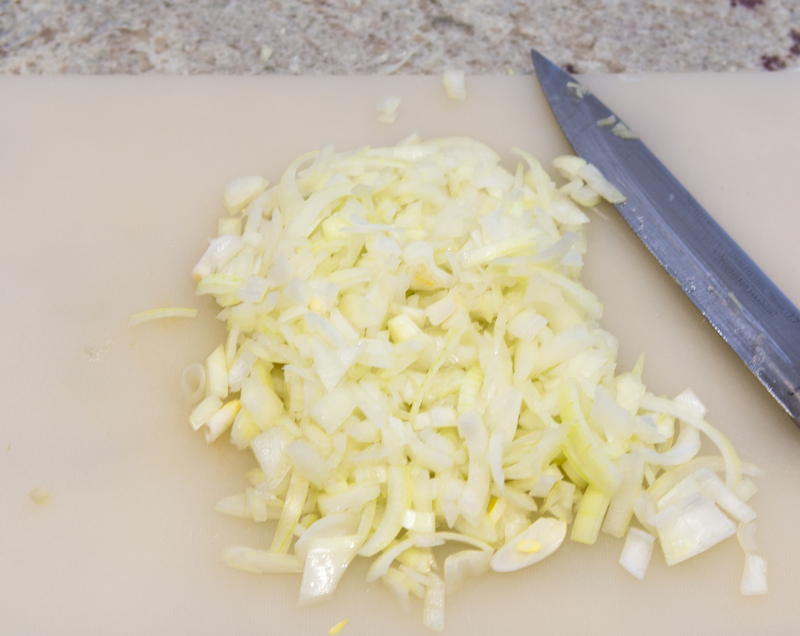 Heat gently and then add a vast majority of the onion and let it soften but not brown. Then add the garlic and cook for further two or three minutes. Then add the chopped chicken and stir. You want the chicken to be slightly browned all over, which takes about 7-10 minutes. Don’t let the onion burn. Meantime soak the saffron in the (hopefully piping hot) chicken stock and set aside. When the chicken no longer has flesh coloured bits, add the slices of chorizo and stir around and let it all sweat for a few minutes. Then add the rice and stir so that the rice is coated with the lovely rich, red juices from the chorizo and chicken. Then add the chicken stock and half the wine; very carefully bring to bubbling point (it is easy for it to catch at this point) and reduce to a very gentle simmer; and the seared red pepper and put lid on (but do not lock if using pressure cooker). Let it cook ‘til rice is nearly done. However tempting, do not stir. Meanwhile in another pan add a little olive oil and the remaining handful of onion. Stew for a minute or two and add the fish stock and remaining wine and boil hard ‘til reduced by about half. At this point turn back to the main pan of paella; if nearly done, add the prawns and shove the lid back on until they are cooked. Raw will take a little longer than pink cooked ones. 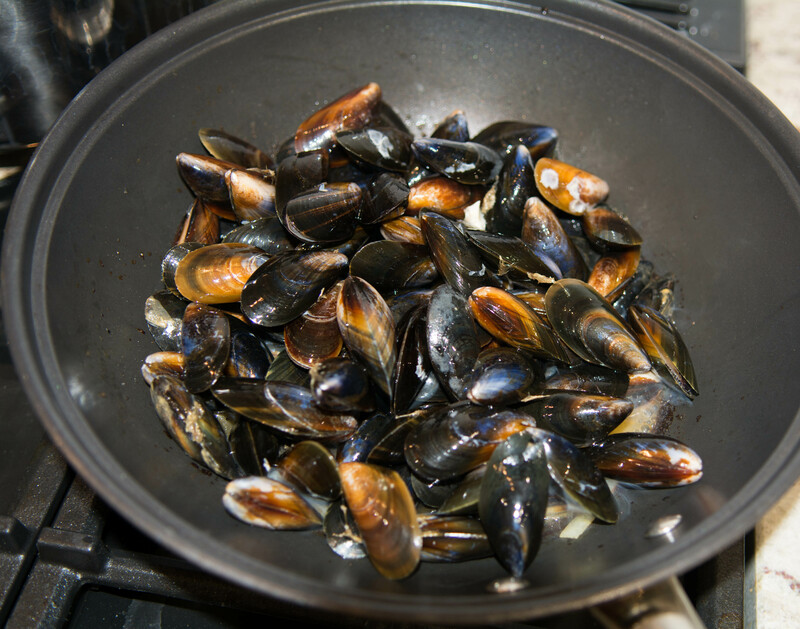 Returning to the reduced fish stock and wine pan, add the mussels and cook with lid on ‘til the shells are open – about five minutes. Pour the mussels and juice on top of the paella and it’s done. Grind black pepper but no salt (‘cos of stock). Add the chopped coriander before serving. Serve with a good green salad or French or runner beans steamed, tossed with a clove of sliced garlic and a knob of butter. 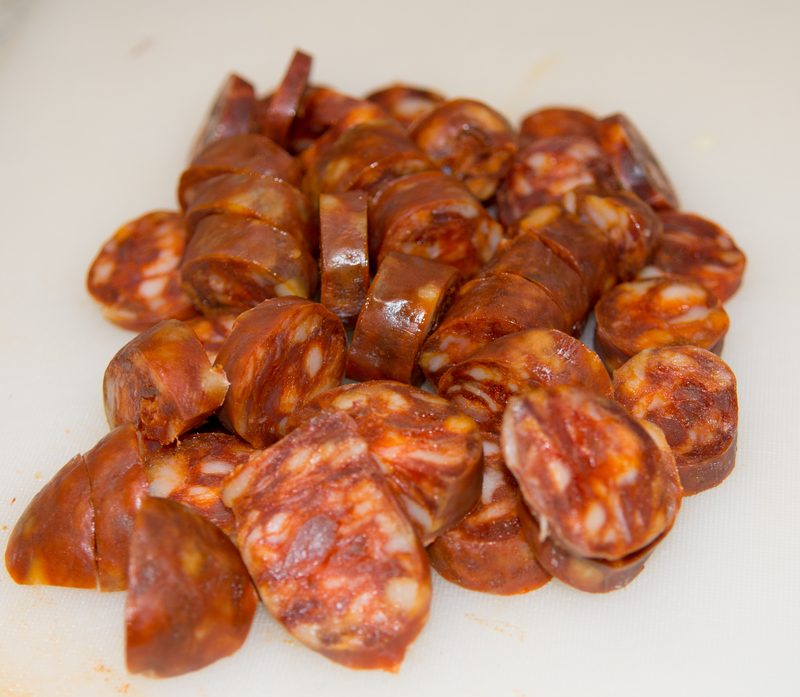 You can use paella as a simple source for left overs too: sausages and chopped bacon cooked from a breakfast or another dish go in when the chorizo does. Peas or French beans can go in at the end – if already cooked from another meal! The best Paella I have ever tasted! Why thank you Dawn; very kind to say so! !